Taken in the grounds of the Rothley Baptist Chapel with North Street in the background and Cross Green trees on the left. Taken around 1958/9. This is a group of some of the members of the Baptist Chapel Sunday Afternoon Bible Class. Graham Baum, Rev. Sleeman the Minister of the chapel, Michael Clark, Donald Welch, Barry Welch. Mary Lambourne, Shirley Lines, Evelyn Clark, Maureen Baum, Betty Welch. 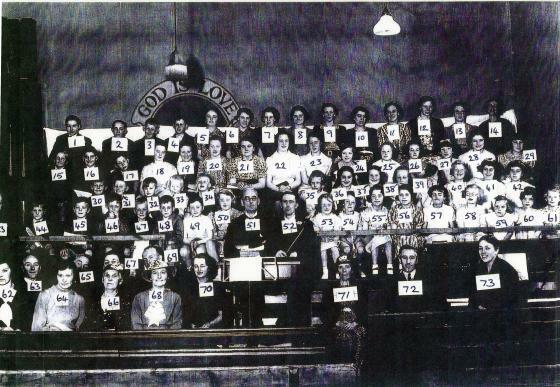 This photo could have been taken around the time that the Rev. Sleeman was moving to another location. Graham and Maureen are the brother and sister of Neville Baum who kindly gave the photograph. Kenneth Lewis, Graham Routley, Mrs Routley, a guest of Mr and Mrs Routley from Germany called Jurgen (or Jourgen), Judith Baum, Rosemary Cracknell, Barry Leader, Rev. Coates, Trevor Routley, Neville Baum, unknown. Joy Hyman, Margaret Veasey, Diane Milner, Jane Arnold. With thanks to Neville Baum for the photograph. 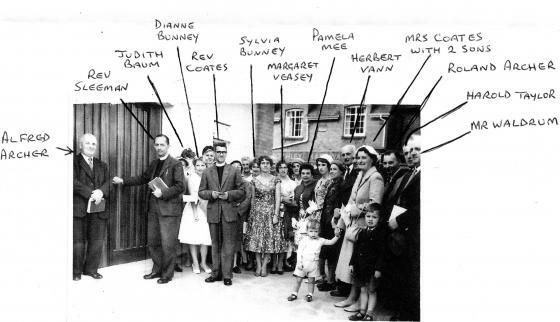 The wedding photograph of Betty Welch and Tony Ball shows the original Woodgate entrance to Rothley Baptist Church. The original notice board is there showing the Rev. L. Coates as the Minister. 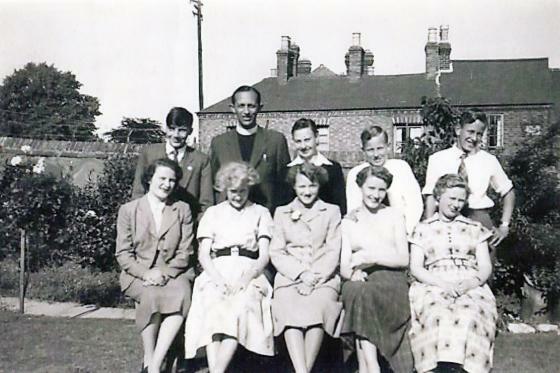 Sheila Talton (Bridesmaid), Martin Mawby (Pageboy), Tony Ball, Betty Welch, Susan Mawby (Bridesmaid), Ivy Welch, Jennifer Mee (Bridesmaid), Michael (Mick) Ball. 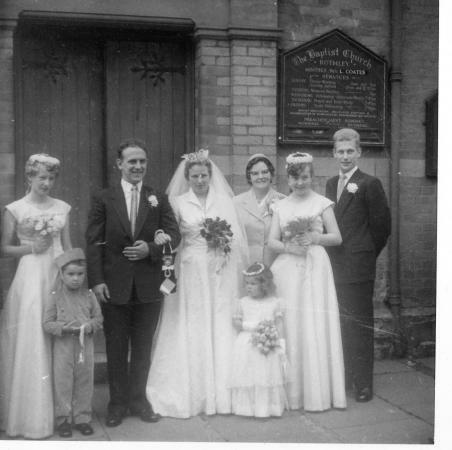 With thanks to Betty and Tony Ball in 2014 for permission to publish their wedding photograph to show part of our village history. If you can add any names to the following list please contact me at the address below. 50. Phyllis Ragg (Hyman) aged 7 years. With thanks to Joan Halman and Nev Baum for researching the names so far. Also Phyllis Ragg. 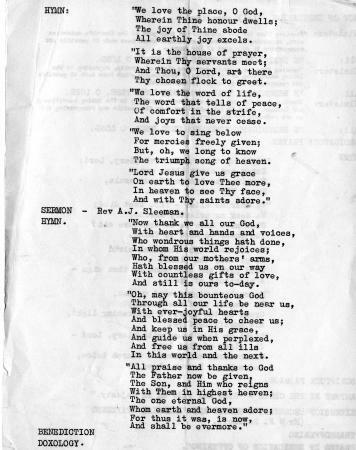 Sunday School Anniversaries were a very important part of the Baptist Church and below is a report from 1964. 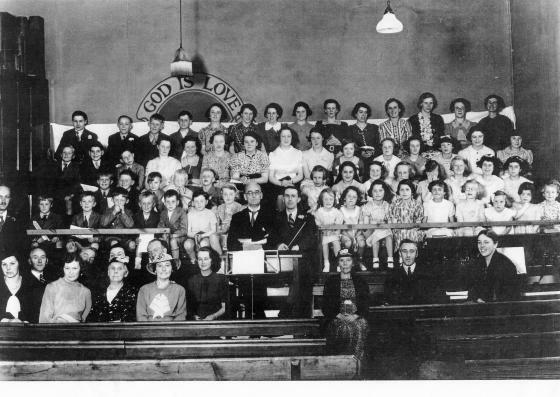 The anniversary services of the Baptist Church Sunday School were held on Sunday when the preachers were the Rev. T. J. Budge, of Leicester, and the pastor, the Rev. R. H. Woodford. 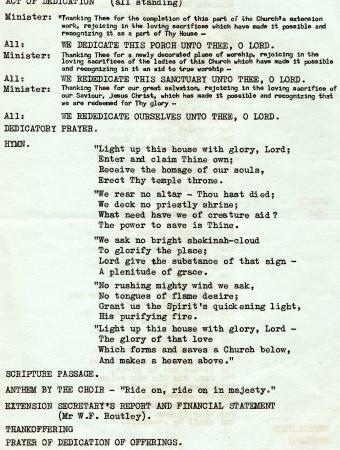 A feature of the service was the special singing of the anniversary hymns by the scholars, under their conductor, Mrs. E. Anderson, of Birstall, with Mr. A. E. Archer at the organ. Soloists were Susan Cleaver, Patricia Perry, Penny Copson, Vicky Sault, Kim Lole, Deborah Perry, Beverley Crouch, Par Cleaver, Joyce Overton, Barbara Samuel, Linda Holland, Pamela Smith, Glynda Holman, Georgina Milner, Judith Samuel and Cherry Cross. Mrs. Holman, leader of the Intermediate Sunday School, who is leaving to take up residence in Ireland, was presented with a fountain pen. Her children, Glynda and Mark Holman, were presented with vouchers. Glynda was also presented with a Bible. Collections, for the Baptist Sunday School, were £48. 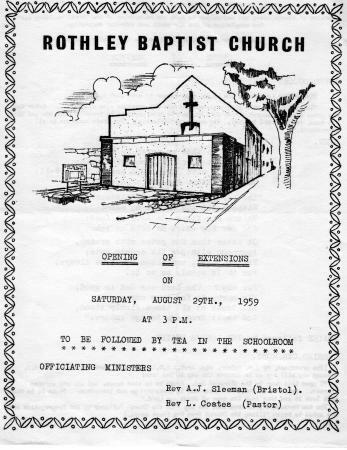 The official opening in 1959 of the new front entrance to Rothley Baptist Chapel. With thanks to Neville Baum for this photograph and names and the Opening of Extensions Programme below. The official opening of a £2,000 extension at Rothley Baptist Church was performed on Saturday by a former minister, the Rev. A. J. Sleeman of Bristol. The porch was been built along the gable end of the church, creating a new entrance. Members have been working to raise the money since clearance area land adjacent to the church was bought in 1955. It was originally intended to build a new schoolroom and a new porch on the land but the schoolroom, estimated to cost about £1,000 will not be added until more money has been raised. The opening ceremony on Saturday was coupled with the re-dedication of the church after interior decorations. The re-painting, which cost £115, is in a light, modern scheme. The re-dedication service was the first held in the church since building and renovation work started earlier in the year. 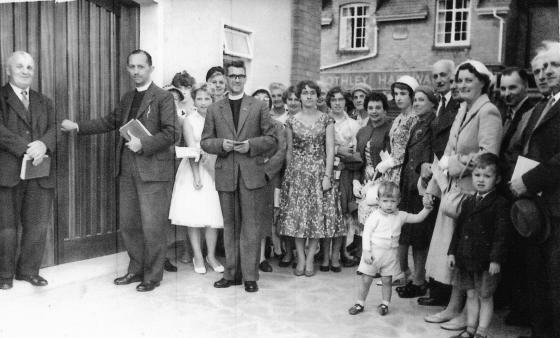 Before the congregation entered the church, Mr Sleeman performed an official opening of the porch which was designed by two members, Mr. and Mrs. H. J. Halman and built by a Rothley firm. Mr. Sleeman was handed the key by a steward, Mr. Alfred E. Archer. The minister, the Rev. 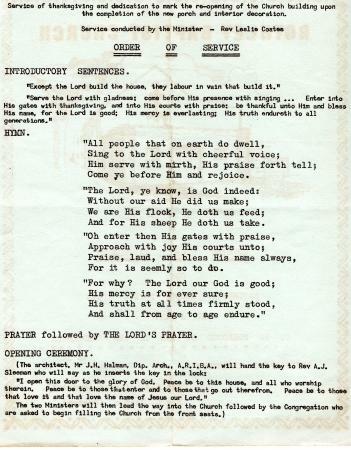 L. Coates, conducted the service which followed and Mr. W. F. Routley read a financial report on the work. The porch cost £1,970 and the quantity surveyor's fees were £90. There was still a small deficit in the building fund, he said. 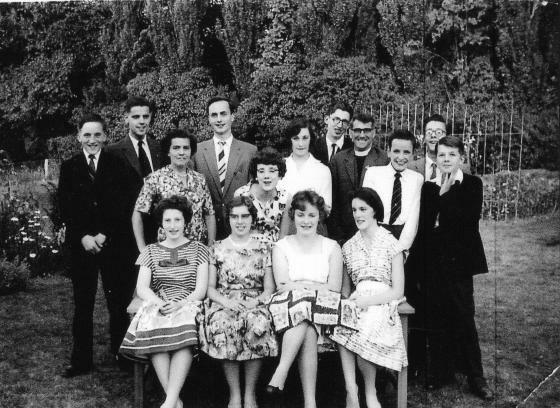 The above report was published in the Loughborough Monitor on Friday September 4th 1959.